Amman Imman "Water is Life"
Live music, student presentations, guest speakers and refreshments will bring together an array of parents, teachers and students from area Montessori schools as they learn about Program Amman Imman directly from its founder and director, Ariane Kirtley. 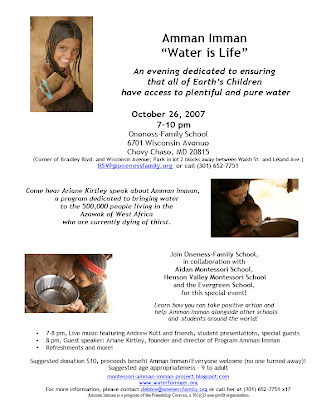 Ariane will talk about the 500,000 people in the Azawak of West Africa who are currently dying of thirst. She will also tell about the people of Tangarwashane, a small village in the region, and how their lives have changed as they now can easily access fresh water from the borehole built by Amman Imman. The borehole reaches sustainable aquifer waters deep beneath the ground, the only way to get pure water to the Azawak, and the way that Amman Imman has laid plans to implement throughout the region. While this is a story of desperation, it is also a story of hope. Interested schools and individuals will have an opportunity to plug into activities designed to engage students to participate in the project through student presentations, curriculum objectives, awareness campaigns, school fund raising projects and collaborative money-raising initiatives. The intention is for Montessori students to work togother and make a tangible difference in the lives of the people of the Azawak by building a Well of Love. The event will begin at 7:00 pm with live music, refreshments and an opportunity to sign up to help with the various initiatives already underway. A sharing of student offerings will follow, plus some special guests. At 8 pm, Ariane Kirtley will give her presentation which will include an update on Amman Imman's work in the Azawak from March through July, 2007. Questions and answers, more opportunities for participation, music and more will close the evening. We hope that everyone who lives within the Washington D.C. area will join us for this special evening!